Get three channels of classic British tube tone from a portable 1x12 combo. 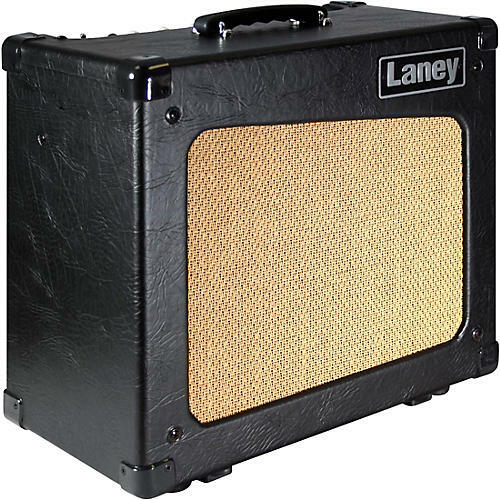 The Laney CUB12 all tube guitar combo delivers 15 watts of pure tube tone from a pair of EL84 power tubes into its 12" custom-designed HH speaker. Designed and engineered in Great Britain, the CUB12 delivers 15 watts power and tone via a pair of EL84 power tubes. In addition a less than 1 watt power option can be used, giving the same power tube tone at lower volume levels. Coupled with 3 x ECC83 pre-amp tubes the CUB12 goes from warm cleans to rich crunch giving the classic tones you need. The CUB 12 houses a 12″ HH driver. HH have custom-designed the driver exclusively for Laney giving the perfect loudspeaker pairing to the amplifier. For an expanded rig the CUB12 can also be hooked up to a larger cabinet via its extension out socket. Try a 2×12 or even 4×12 cabinet and be prepared to be blown away! Dimensions: 16.8" x 17.12" x 9.25"